Here’s a twist on Two Truths and a Lie to play at your Thanksgiving get-togethers this year: provide everyone with slips of paper and pens and have them write, on separate pieces of paper, one thing they’re thankful for this year, and one thing they’re not. Collect the papers after a respectable amount of time (once all the Mary’s Gone crackers are gone and a few people have resorted to the veggie platter), and take turns reading them aloud. The group then tries to guess who wrote it, and whether he or she is thankful or unthankful for it. If you’re competitive, you can award points to those who guess right, and make the loser do the dishes. That’ll net you some thankful guests. Thankful, I guess, though a miraculous recovery would’ve been better. Would be thankful, if it had happened. Thankful. Although don’t ask me that at the bottom of the stairs. Super thankful! If you pop over and “endorse” me, I’ll be even more so. Thankful: sorghum, flaxseed, amaranth, millet, cornmeal, brown rice flour, hot cereal, brownie mix, CHICKPEA FLOUR, and probably more make this one a no-brainer. Ask my coworkers about the 16-box cartons of each that arrived to my attention courtesy of Amazon. Call it thankful but ashamed. Ten months’ worth of lost receipts say no. Thankful. So good of them to wait till I was diagnosed to do anything. I guess I sorta gave you that one. Check in with me next Thanksgiving. Games aside (and not to get all sappy on you), I have more in this almost-a-year of being gluten-free to be thankful for than not. Oh, sure, would I give back the incurable disease, the copays, the media scoffing at my diet, the bagel crumbs in the office kitchen? Yup. But I’m grateful to have loving and supportive friends and family members; to live in the golden age of gluten-free food; and to be here at my childhood home, surrounded with stockpiled gluten-free equipment and ingredients waiting to come together into a meal we’ll all be able to enjoy tomorrow (the low-carbers, veg-heads, hockey-puck cranberry saucers, gluten-freebies, and all). Happy Thanksgiving! 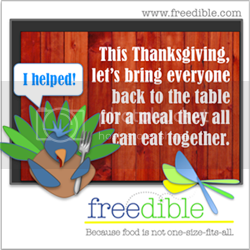 What are you thankful and not thankful for this year?